I’ve just finished reading Christopher Somerville’s entertaining, vivid and thought-provoking book, The January Man. In outline, it’s an account of the year, month by month, describing a walk (or sometimes several walks) in a different part of the United Kingdom for every month. 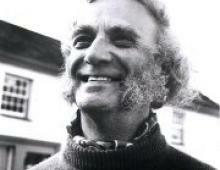 Somerville is well known as the Times walking correspondent, so he’s ideally qualified to guide us, whether it’s on the Norfolk coast or the remote island of Foula in the Shetlands. But his book is about much more than walking. Besides beautifully-written observations of nature – trees, birds, insects, fungi – as the seasons turn, the book explores Christopher Somerville’s many enthusiasms: it’s full of fascinating reflections on music and poetry, ecology and folklore, tall stories, old buildings, modern farming and a thousand other things. At one moment, Somerville is recreating a youthful hitchhiking expedition that took him and a friend all the way to Istanbul; the next, he’s recreating a long-gone country fair in Wiltshire, now almost forgotten but a few short generations ago so important that half a million sheep and 750 tons of hops were sold there annually, and cheese was traded by the ton. 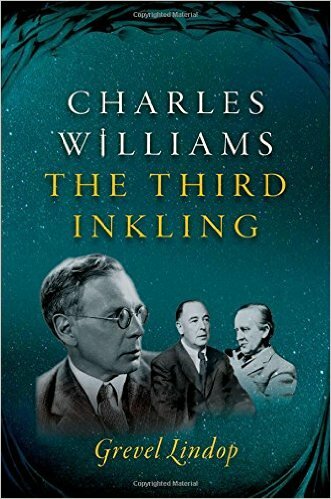 As if that’s not enough, the book sketches – lightly and engagingly, in touches that build up month by month into a vivid portrait – memories of his father, a taciturn man who never spoke much about his quietly courageous war service, and even less about his top-secret work at GCHQ. Walking together on long-distance footpaths was, mostly, the closest father and son came to shared communication. It’s all perfectly judged: moving and fascinating without any sense of emotional overspill. Quite an achievement, and one that will touch a verse with many of us whose parents were from that emotionally-reticent generation. Christopher’s website is at www.christophersomerville.co.uk – For a link to order the book, see foot of this page. 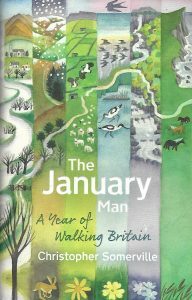 As a bonus, the book introduces us to Dave Goulder’s great folksong, ‘The January Man’, from which it takes its title. I can’t find Martin Carthy’s performance of that fine song (the version mentioned in the book) so I’ll put in a haunting version by the Albion Christmas Band with some charming if slightlky kitsch astrological imagery (no offence – as I wrote once in a poem about Mexico, in some contexts ‘kitsch is authenticity’!). The January Man is definitely one of my books of the year: the perfect Christmas present for anyone who loves walking, or the countryside, or loves odd facts and surprising stories. Add a beautiful cover painting, and a link to download a free walking guide from Christopher Somerville’s website, and what more could you ask? I’m already realising how lazy I’ve been this year. The shortest day will soon be past; and then I swear I’ll lace up my boots and be on the move again. Thanks, Christopher! I spent the weekend at Cockley Moor, in the fells above Ullswater. 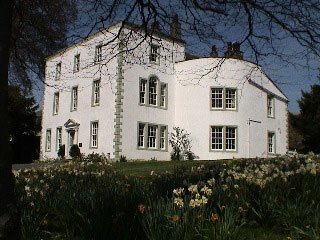 The excellent Norman Nicholson Society had organised a Study Weekend and I was delighted to be asked to give a talk – not just because I love and admire Nicholson’s poetry but because I’ve always longed to get inside Cockley Moor, a house with a wonderful history. 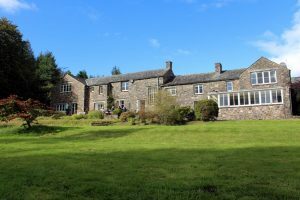 Cockley Moor, an old farmhouse with many extensions – so that it now runs along the top of the fell for quite some way – was the centre, in the 1940s, 50s and early 60s, of an amazing circle of artists, writers and musicians. Helen Sutherland, a wealthy patron of the arts, moved there in 1939 and invited a galaxy of creative people to visit and stay, sometimes for long periods. These included Ben Nicholson and his wife the painter Winifred Nicholson; sculptors Naum Gabo and Barbara Hepworth; poets Kathleen Raine, TS Eliot, and Norman Nicholson (no relation to the other Nicholsons); David Jones, who was both poet and artist; and the pianist Vera Moore, amongst others. 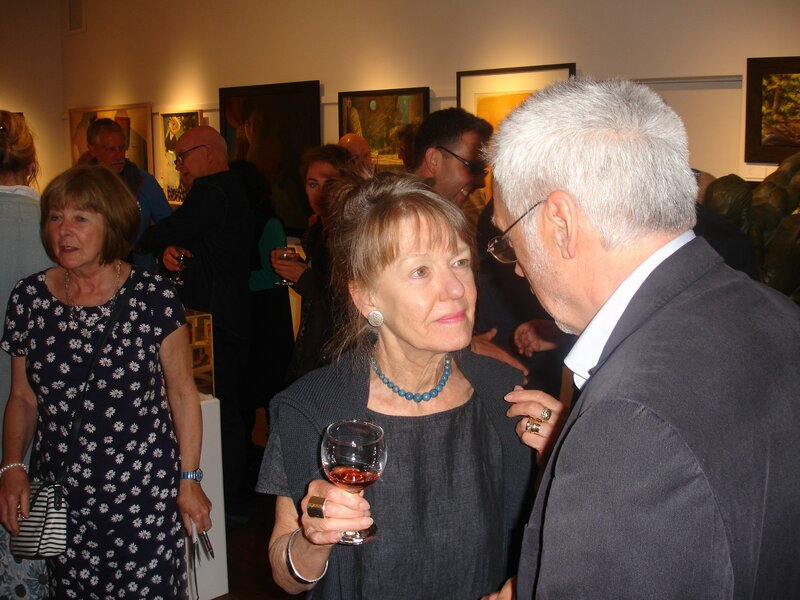 Helen Sutherland also had a fine art collection including Seurat, Hepworth, Jones, both Nicholsons, Brancusi (and Picasso, whose work she decided she didn’t like, so his two paintings were kept in a cupboard!). The art collection has now been dispersed: Helen Sutherland died in 1965 and the house was later lived in by the astronomer and sci-fi novelist Fred Hoyle. But the house is still beautiful and atmospheric. And the weather was perfect: golden sunshine giving a warm radiance to the views across the fells. It was lovely to be there with almost thirty lively, knowledgeable poetry enthusiasts to discuss Nicholson and the artistic heritage of Cockley Moor, with excellent talks by Val Corbett, photographer and author of the splendid book A Rhythm, a Rite and a Ceremony: Helen Sutherland at Cockley Moor; Philip Houghton on Norman Nicholson’s poem ‘Cockley Moor, Dockray, Penrith’; and Caroline Watson on Kathleen Raine. 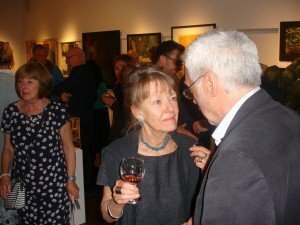 Also taking part was my friend Kathleen Jones, poet and biographer of Norman Nicholson. 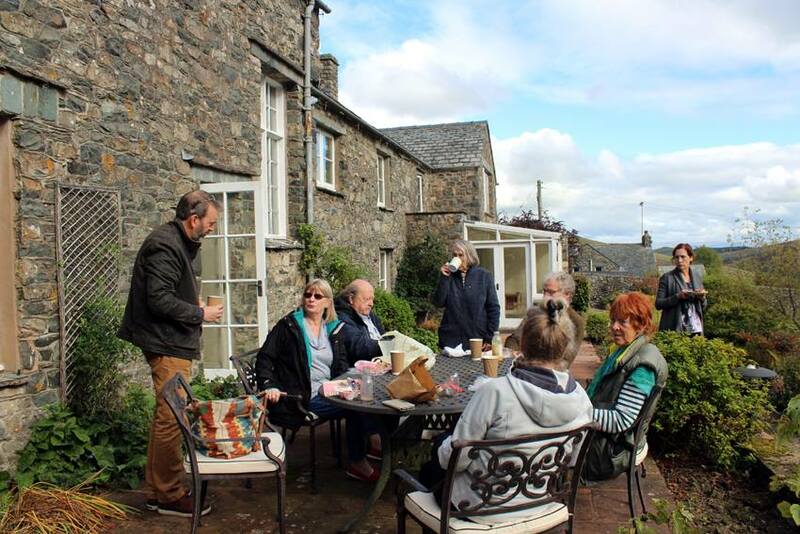 (I’ve borrowed this picture of the terrace discussion from her Facebook page – I hope you don’t mind, Kathy!). 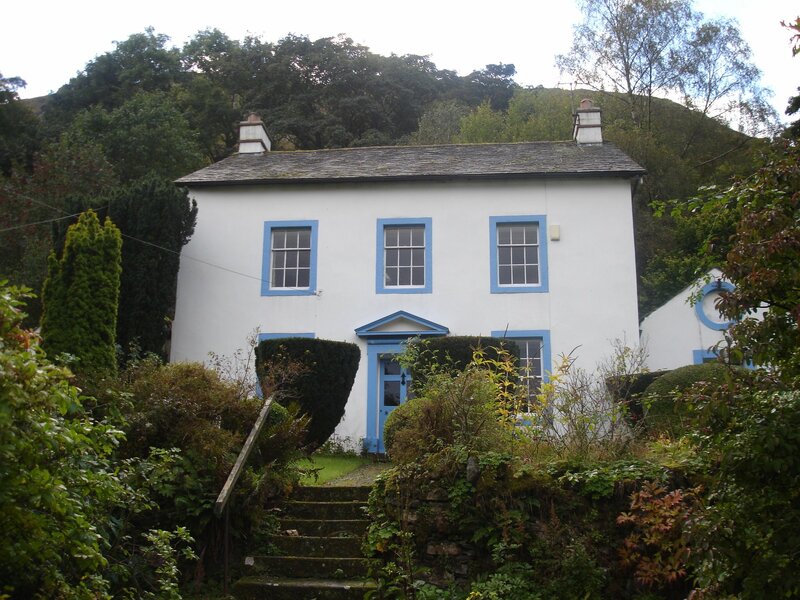 After the closing session at Cockley Moor, Caroline Watson and I made a pilgrimage to the other side of Ullswater to visit Martindale Vicarage, where Kathleen Raine had lived during the war. The little house under the fell is still as beautiful, quiet and mysterious as Kathleen describes it in her memoir The Land Unknown. Coming face to face with Linda Ryle’s painting ‘Show Me the Moon’ a few days ago was a shock: I’ve been so used to seeing it as a 13 by 17 cm cover image on my book Luna Park that I’d forgotten quite how big it really is. Meeting it again in this new exhibition at the Heaton Cooper Studio, Grasmere, was a pleasant surprise. The painting – even more fascinating at its full size, naturally – draws you in hypnotically, with its affectionate yet slightly eerie rapport between woman and cat, and the tiny glimpse of the new moon in a limpid, radiant sky. The sense of mystery, of magical meanings only half-revealed, is typical of Linda Ryle’s work (she’s also know by her married name as Linda Cooper), and this retrospective exhibition, Time Regained: 1975 – 2016 reveals these qualities as connecting elements running through some quite diverse work. 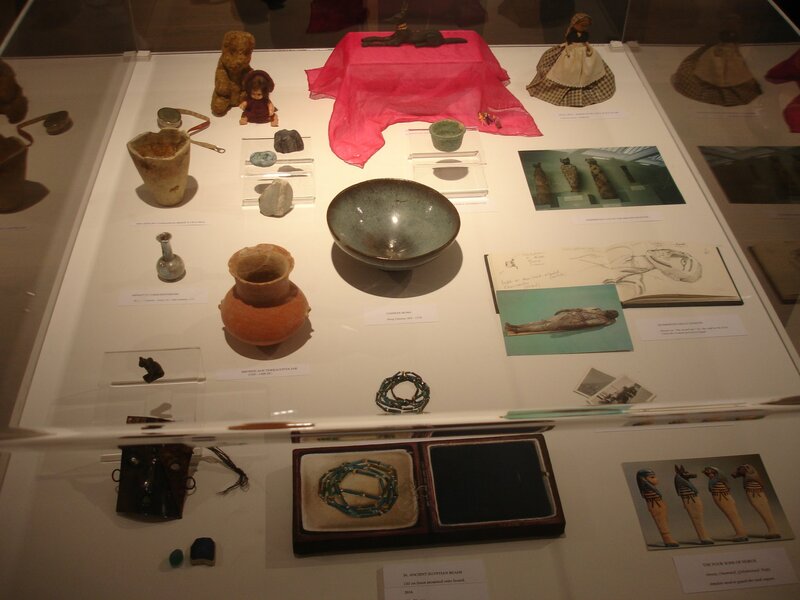 There are landscapes, figure paintings (with animals) , still lifes – often incorporating ancient Egyptian or Roman sculpture and other artefacts – and most recently detailed, almost trompe-l’oeil studies of little corners of domestic interiors: a spice cupboard; a flight of old, deeply-worn stone steps; a crucible burning with fierce flame and backed by black smoke. 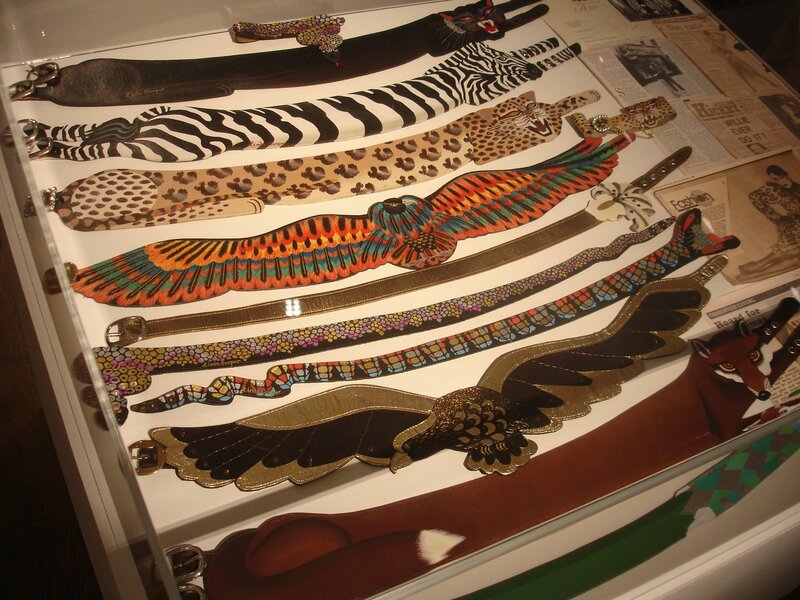 There’s even a display of the wonderfully vivid and imaginative belts, hand-painted with animal forms, which Linda supplied to a King’s Road fashion boutique in the 1970s, and which were acquired by (amongst others) Elton John, Bianca Jagger and Britt Eklund. 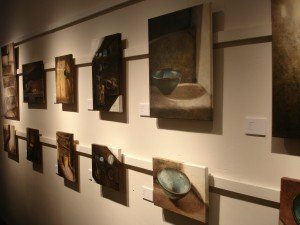 What connects all of these works, along with a love of detail and an evocative use of colour, is a sense of symbolism, of contemplative and often disquieting meaning hidden within each image. It’sa world not unlike that of Leonora Carrington, who similarly loved to blend pagan imagery with encounters of animals and humans who had a more than normal rapport with one another. I’m inclined to think Linda deserves a place in the rich but elusive category of female surrealists, though the subtlety of her work is far from the simply bizarre or aggressively disruptive effects we might associate with mainstream (usually male) surrealism. Linda Ryle has a deep interest in Jungian psychology, and her work was exhibited last year at the Association of Jungian Analysts in London. Strikingly, to me the most powerful works were the most recent. The meticulous representations of details of her eighteenth-century house in Cockermouth, such as a staircase leading down into a cellar, are extraordinarily suggestive: the apparently ordinary becoming a powerful symbol of something psychologically profound and (I think) more than a little disturbing. These are beautiful images; but don’t be surprised if you feel the hairs on your neck rising a little. In Linda’s work, the everyday becomes the slightly uncanny. It’s a remarkable achievement. 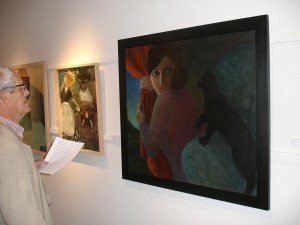 Time Regained: an exhibition of past and present work by the painter Linda Ryle runs at the Heaton Cooper Studio, Grasmere, from July 14 until the end of October. Details from 015394 35280. Last week I was in Belfast for the Belfast Book Festival. 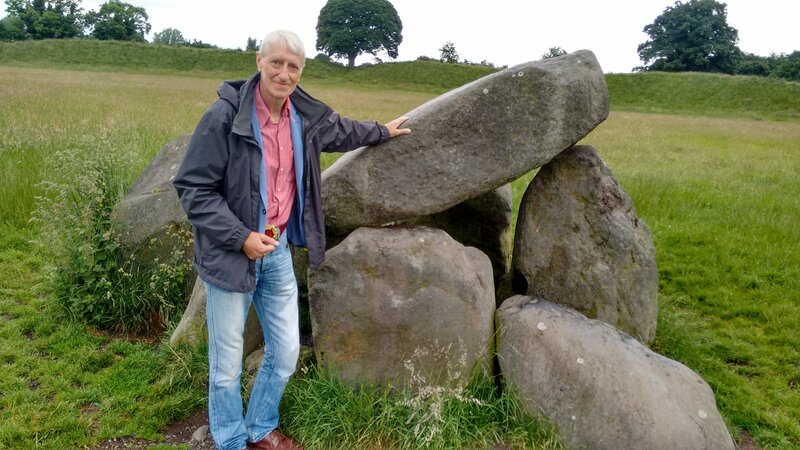 While I was there my old friend Daniel Roberts (Reader in English at Queen’s University) took me to the Giant’s Ring, a local henge monument dating from the Neolithic era (c. 4000-3000 BC). A beautiful and amazing place: it consists of a raised circular bank (technically, the ‘henge’) 180 metres in diameter, with a passage tomb – the kind of thing we might think of as a ‘dolmen’ or ‘cromlech’ – in the centre. 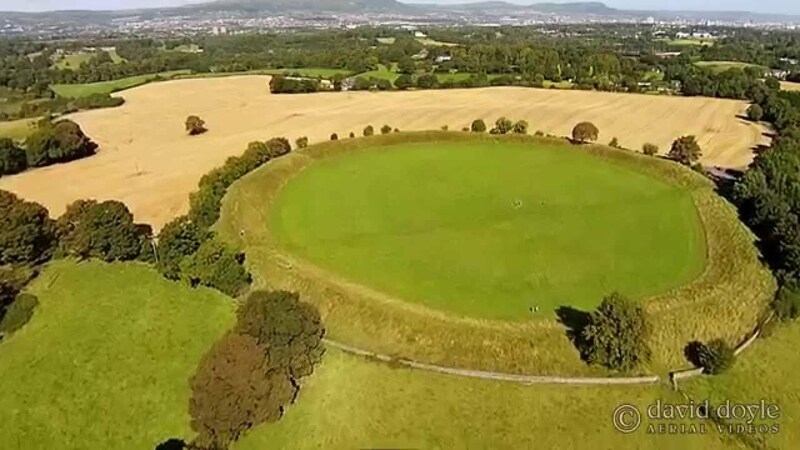 I was fascinated because it’s so much like Mayburgh Henge just outside Penrith in Cumbria. 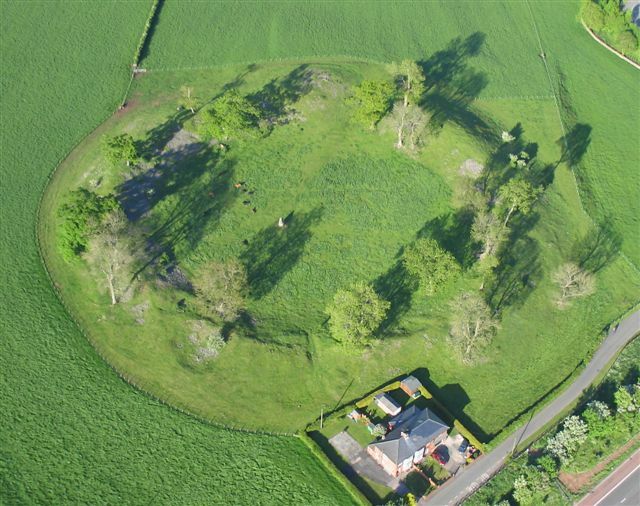 The main visible difference is that Mayburgh has huge ash trees growing on top of the circular bank, so that shape is not quite so obvious. 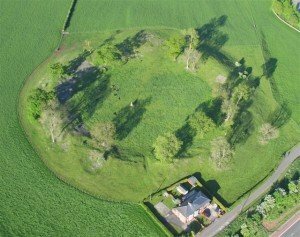 Mayborough is 117 metres across, and long ago it had four standing stones at the centre. 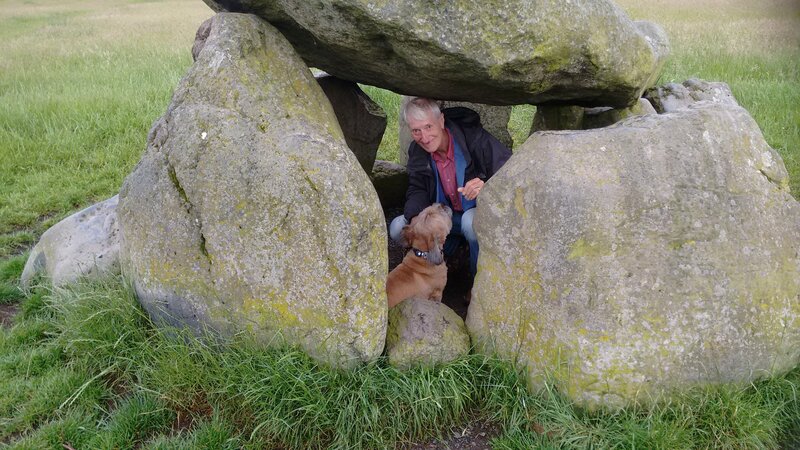 Now there’s only one, but I wonder if those four were also the supports of a passage grave once upon a time? If so, both monuments would be of the same type – perhaps public assembly arenas, around the tomb of an important ancestor? Not Just the Lake Poets! I’ve recently updated my Literary Guide to the Lake District, so that this comprehensive and entertaining guide is now easier to use and more helpful than ever. One of the fullest and most readable guides to the Lakes, it now gives websites, where these exist – and they usually do – for all properties that are open to the public and that have literary connections. Arranged in five easily-followed routes so that you can drive or walk to any location with a minimum of trouble, or simply check out places as you get to them, the book is a guide to the places in the Lakes where writers have lived, or that they’ve written about, from Roman times up to the present; and it goes far beyond what you’d expect. Of course the usual suspects are there. The Guide will take you, if you like, to every place that Wordsworth, or Coleridge, or Beatrix Potter, or Arthur Ransome wrote significantly about. But did you know that Thomas Hardy went boating on Windermere, rather than waste his time attending George V’s coronation? That Oscar Wilde lectured on Beauty in the Cumbrian coastal town of Maryport? Or that James Joyce wrote, in Finnegans Wake, about a monument in Penrith Churchyard? Or that First World War poet Edward Thomas was a keen walker in the Lakes and wrote a poem about a friend’s house there? The literary connections of Lakeland are rich and incredible, and this book will open them up for you – as it did for me when I researched it! 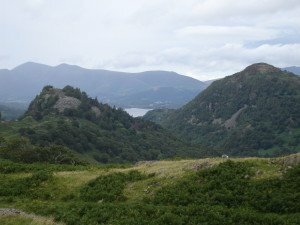 I’ve been over every mile of the Lakes on foot for many years, and exploring its writers, both famous and little-known. To order A Literary Guide to the Lake District, just click on the cover-image at the right hand side of this page; or find my page on Amazon.